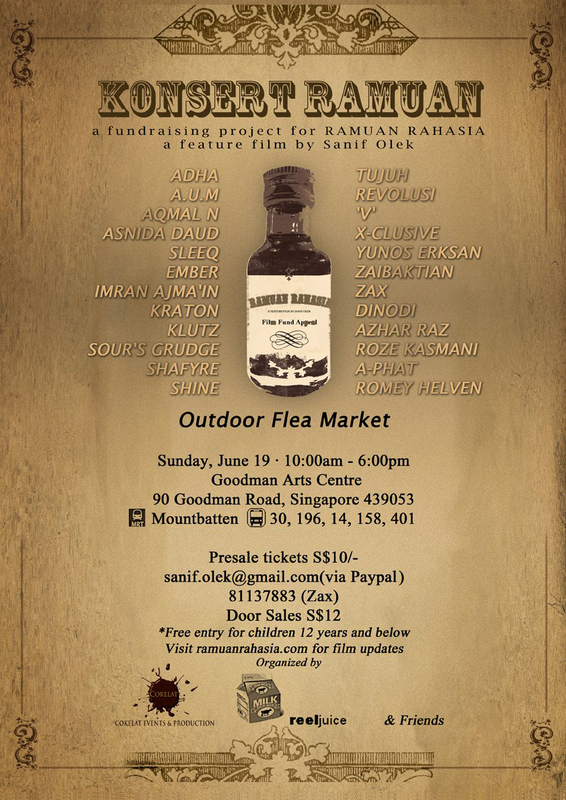 KONSERT RAMUAN is a music festival that brings together various Singaporean artistes, performing in solidarity to raise funds for Sanif Olek’s yet-to-be-completed feature film, RAMUAN RAHASIA. A total of 24 bands and solo acts will be sharing stage on Sunday, 19 June 2011 from 11am to 6pm at the Goodman Arts Centre (90, Goodman Road, S439053). Together, fascinating flea market with vendors selling eclectic products will add colour to the event! KONSERT RAMUAN is only the first of a fundraising project series that hopes to create awareness about the film appeal for funds. Following this concert, a monologue ensemble, entitled MONOLOG RAHASIA, featuring established theatre/TV actors is already in the pipeline. KONSERT RAMUAN tickets are already on sale @ $10 via Paypal (sanif.olek@gmail.com) and Zax (81137883). Tickets will also be available at the door on the event day at $12. Free entry for children aged 12 years and below. For those interested to rent a table at the flea market, they may contact Zio at 90214934. All proceeds from the concert will be channeled to the RAMUAN RAHASIA fund appeal. RAMUAN RAHASIA is a feature film, directed by Sanif Olek that has abruptly stalled since late 2009 due to insufficient funds. To date, only 60% of its filming has been achieved. The project is now racing to be completed. It is an endearing tale of hope blending spicy food, classic Nusantara Malay songs and love into a digestible contemporary platter. It boasts a stellar cast from Dato’ Rahim Razali to Aidli ‘Alin’ Mosbit, Rafaat Haji Hamzah, Keagan Kang, Aaron Aziz, Sani Hussin, J A Halim and many more. For further details on the concert, please contact Azizah Zakaria at 94248514.